Dignity in Dying responds to the news that the Royal College of Physicians (RCP) will drop its longstanding opposition to assisted dying and adopt a ‘neutral’ position, following the UK’s largest ever survey of medical opinion on this issue. 31.6% voted for The RCP to adopt a supportive stance (an increase from the 2014 survey). 43.4% voted for The RCP to adopt an opposed stance (a decrease from the 2014 survey). Because no clear majority voted for a supportive or opposed stance, the RCP will now adopt a neutral stance on assisted dying. Fewer than half of respondents to the survey said they were personally opposed to assisted dying. The survey was completed by 6,885 respondents from more than 30 specialties. “It is highly significant that the oldest medical college in England has dropped its longstanding opposition to assisted dying in favour of a neutral position. This will allow the RCP to accurately reflect the range of views among its members and to contribute its expertise to the debate in a more balanced way. The RCP will now join the Royal College of Nursing, and medical associations around the world which have taken a balanced and compassionate stance on this issue. “This week research by Dignity in Dying and by Open Democracy has revealed the network of anti-choice activists working together to attempt to silence the RCP. Those behind a legal challenge to the RCP over its survey (which was rejected by the high court today) appear at first glance to be a grassroots group of doctors with evidence-based concerns, but digging deeper, their opposition appears to have links to faith-based, anti-choice agendas. This vocal minority is not representative of the majority of doctors or of the public. “With 80% of the British public supporting a change in the law to allow terminally ill people a say over how and when they die, and over 100 million people in the USA and Australia and across Canada having access to safe, compassionate assisted dying laws, it is clear that this issue is not going away. Medical organisations in these places have seen that providing the option of assisted dying to their patients is perfectly compatible with a doctor’s prime purpose, which is to relieve the suffering of their patients. This move from the RCP will allow the voices of terminally ill people and their loved ones to rightly be front and centre in this debate. For further information and interviews with representatives of Dignity in Dying or Healthcare Professionals for Assisted Dying, please contact Ellie Ball at ellie.ball@dignityindying.org.uk / 0207 479 7732 / 07725 433 025 or Tom Davies at thomas.davies@dignityindying.org.uk / 0207 479 7734. The RCP has been officially opposed to assisted dying since 2006. The last survey conducted in 2014 found that RCP members and fellows had a range of views, but no majority for any particular stance. While a plurality (44%) of its members believed the College should be opposed, a majority believed the College should either be in favour (25%) or neutral (31%). 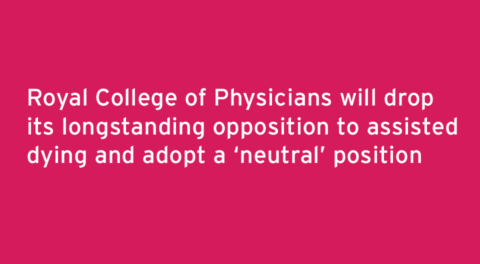 The RCP announced in January 2019 that to better reflect the range of views held, unless a 60% supermajority voted in favour or in opposition to assisted dying in their upcoming survey, the College would adopt a neutral position. In March 2019, it was announced that a judicial review was to be brought against the RCP, challenging its decision to commit to a neutral position on assisted dying unless a supermajority was reached, and attempting to prevent the results of the survey from being published. As of Thursday 21 March 2019, the legal challenge was rejected by the High Court. This week research by Dignity in Dying and by Open Democracy revealed that those behind the legal challenge are part of a network of anti-choice activists which has a long history of campaigning for pro-life causes and connections to American pro-life lobbyists. Royal College of Nursing, Royal College of Nursing Scotland, Royal College of Psychiatrists and Royal Pharmaceutical Society all hold a neutral stance on assisted dying. British Medical Association has never surveyed its members on the subject but maintains a stance of opposition. General Medical Council, General Pharmaceutical Council, Royal College of Anaesthetists, Royal College of Obstetricians and Gynaecologists, Royal College of Paediatrics and Child Health, Royal College of Physicians of Edinburgh, Royal College of Surgeons of Edinburgh hold no stance on assisted dying. Currently, every 8 days  someone travels to Switzerland from Britain for a legal assisted death – a process which costs £10,000 on average  and often causes people to die earlier than they would have wanted in order to be well enough to make the journey. Polling has found that over half (53%) of Brits would consider travelling abroad for an assisted death if terminally ill and two-thirds (66%) would consider breaking the law to help a loved one do so, yet only a quarter (25%) would be able to afford it . A further 300 terminally ill people end their own life in the UK every year . Victoria became the first Australian state to pass a Bill legalising assisted dying for terminally ill people in November 2017. The law will come into effect in June 2019. A similar Bill was defeated in New South Wales by just one vote in November 2017. The Government of Western Australia plan to introduce an Assisted Dying Bill in their state Parliament in the second half of 2019. Dignity in Dying campaigns for greater choice, control and access to services at the end of life. It campaigns within the law to change the law, to allow assisted dying as an option for terminally ill, mentally competent adults with six months or less to live – something supported by 82% of the public . Dignity in Dying does not provide practical assistance or advice in ending life, nor does it provide enquirers with the contact details of organisations who do so. Polling conducted by YouGov, August 2017. A Hidden Problem: Suicide by terminally ill people – Dignity in Dying, October 2014. Polling conducted by Populus, March 2015.